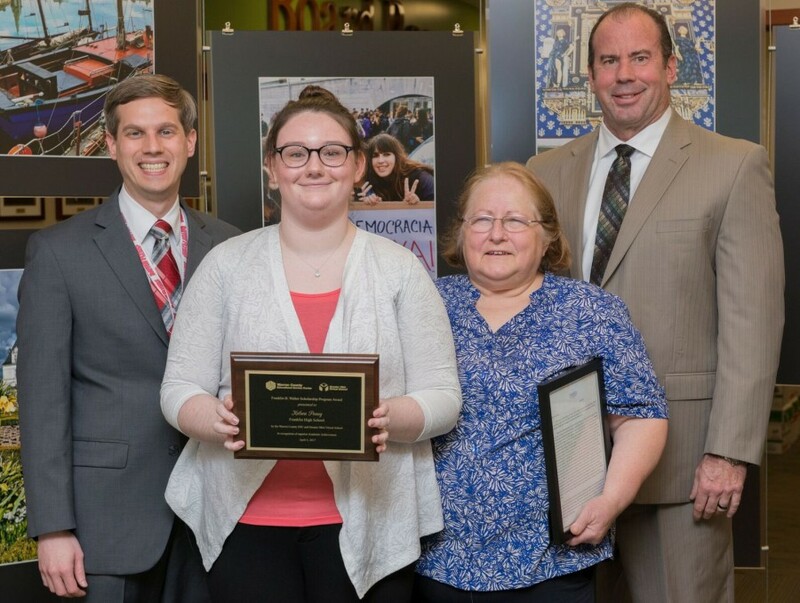 Senior Kelsea Penny was named the Franklin High School winner of the Franklin B. Walter scholarship at an April 5 banquet hosted by the Warren County Educational Service Center. She received a $500 scholarship, a plaque, and a proclamation from Ohio State Senator Steve Wilson. To be eligible for the award, students must demonstrate outstanding academic achievements as indicated by high school test scores and achievement awards as stipulated by the Franklin B. Walter program. Students are also expected to have been a positive contributor in their high school and in their community. Kelsea was chosen as Franklin High School's representative based on her dedication to academic achievement, her involvement in extracurricular activities, and her commitment to serving others. Students were asked to select a teacher or mentor who had had a great impact on their academic career, and to write a letter to the educator. Kelsea selected retired FHS teacher Merry Anne Evans. The Franklin B. Walter Award was established in 1990 by the Ohio Educational Service Center Association to honor Franklin B. Walter, past Superintendent of Public Instruction in Ohio who served from 1977 to 1991. This was the second year that the Warren County Educational Service Center has hosted the award. Participating schools were Carlisle, Franklin, Greater Ohio Virtual School, Kings, Lebanon, Little Miami, Middletown, Springboro, Warren County Career Center, and Waynesville.